Apple has finally entered the streaming music game, with the launch today of Apple Music . The new service is available as a built-in part of its iOS 8.4 Music app for iPhone and iPad devices, and offers a huge catalog of on-demand tracks for streaming playback for just $9.99 per month, or $14.99 for a family plan that allows sharing with up to six users. The service is free for three months from the day you sign up, however, meaning you can take your time figuring out if it’s something you want to pay for in the long run. Apple Music was first unveiled earlier this month at Apple’s Worldwide Developers Conference. The service combines on-demand streaming with playlists generated by human curators, radio stations including the Beats 1 24-hour live station hosted and programmed by real DJs and artists, and additional features like integration of your own library and iTunes Match content. The subscription service goes up against existing offerings like Spotify, Rdio and Google Play Music, to name just a few, and even Beats Music (temporarily, before Apple shutters that after a transition period to get Beats users on the new offering). 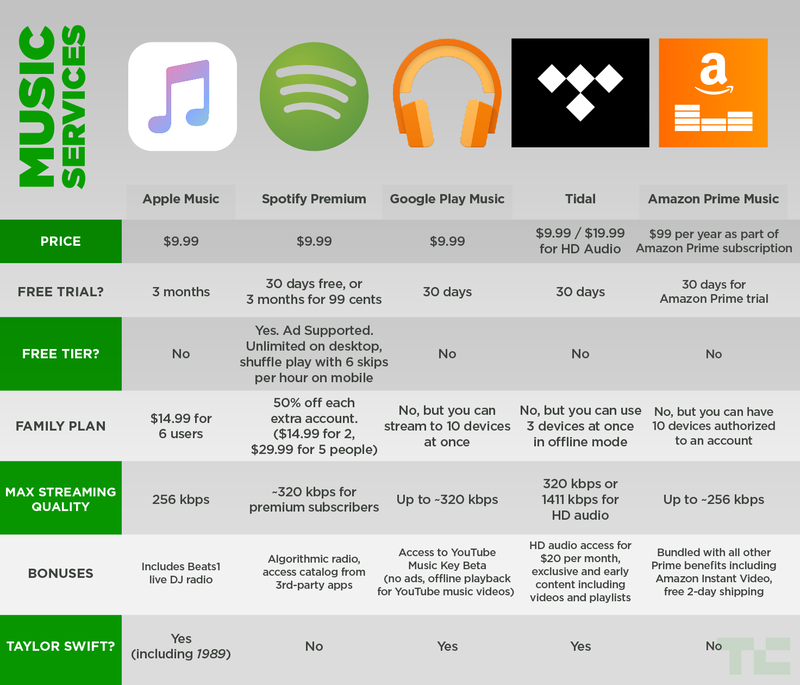 Those have advantages in terms of being early to the scene, and some like Spotify offer a completely free tier (Google also just introduced one) that uses ads to supplement streaming, meaning users don’t have to pay a cent to access tracks. Apple has some significant advantages, however; it has 1989 by Taylor Swift, something no other streaming service can boast. That may seem small, but it’s a symbolic victory that shows Apple may be able to attract more independent artists with goodwill gestures like this. Take also its Connect feature, which is basically a social network for artists, allowing them to post content directly to fans in a feed-style interface integrated into the Apple Music app. This will include exclusive content like videos and recordings. Beats 1 is also unique; no one else can host a human-run 24 hour radio station replete with star power on their service. It’s also available to non-subscribers, but it could have a halo effect to draw people into the subscription offering, too. Finally Apple hopes to attract music lovers with curated playlists constantly edited by experts in various genres, meaning you’ll have tastemakers providing up-to-the-minute recommendations on a constant basis. To get Apple Music, navigate to your Settings app on your iOS device, then go to General > Software Update. An update for the iTunes desktop app that adds the service is also expected today, and there’s an Android app planned for launch later this year. If you’re not able to grab the update right away, just keep trying; Apple can sometimes experience server-side delays given demand on huge launches like these.